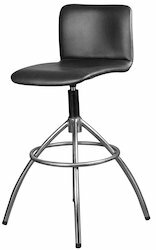 BAR STOOL Metal frame based artificial Leather upholstery bar chair with chrome hydrolic, Half foot rest and disc pedestal. Qutity and colour customer needs. this model as to be fixed, height adjustable and rotatable. Chrome plate, hydrolics and footrest. seating parts ms frame and foam and artificial leather leather upholstory. 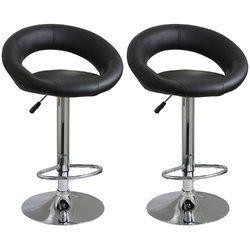 Bar stool with height adjustable chrome disc and Hydraulic with Half foot rest. cushioned seat with artificial leather upholstery. colour will be customized, delivery depends on quantity. Height adjustable, chrome disc and chrome hydraulic. stock availability conformed the selection of the quantity. Frame fabricated ms round pipe with height adjustable and seat & back cushioned upholstory. colour as per the customized. Delivery depends on quantity. 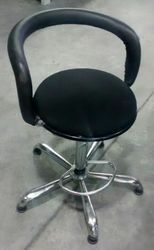 BAR CHAIR WITHOUT ARM - Rexine Upholstered Chair, - Gas Lift Height Adjustable with foot rest. - Chrome disk base - Seat & Back : Moulded ply with artificial leather upholstery. 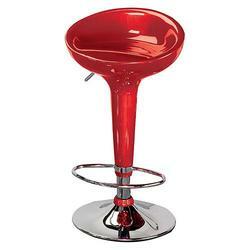 Looking for “Bar Chair & Stools”?